The Rolex Paul Newman Daytona is one of the world's most highly coveted vintage watches. Newman's personal Daytona, which he wore for 15 years, sold for 17.75 million USD at an auction in 2017, making it the world's most expensive wristwatch. Cosmograph Daytona with the especially rare, tricolor "exotic dial"
The Rolex Paul Newman Daytona is one of the most sought-after watches in the world. Its dial sets it apart from similar Daytona models: The desirable Paul Newman version is multicolored and has an Art Deco style. Back in the 1960s and 70s, this look was not nearly as well-received as it is today, meaning very few of these multicolored, so-called "exotic" dials ever entered the market. Low production numbers and the fact that Paul Newman, a famous actor and racecar driver, wore his watch every day have only fanned the flames of this chronograph's legend and have turned it into one of the most expensive vintage watches today. How much does a Rolex Paul Newman Daytona cost? Paul Newman was a big fan of the Rolex Cosmograph Daytona. He owned several examples of this chronograph and is said to have worn an extremely special edition every day for 15 years. His second wife, Joanne Woodward, gave him this watch (ref. 6239) with the engraving "Drive Carefully Me" on the case back as a gift while he was filming Winning in 1969. This exact watch sold for the record price of 17.75 million USD at an auction in New York in October 2017. When Newman gifted the watch to his daughter's then-boyfriend in the 1980s, it had an estimated value of 247 USD. Before Newman gave the timepiece away, it had served as his constant companion, which is why there are so many pictures of him wearing the watch. His preferred band was a black military strap . The "exotic" dial of Newman's 6239 is white with black trim and black subdials. There are also versions of the 6239 with a black dial and white subdials. The "Daytona" inscription is located above the 12-hour counter at 6 o'clock. 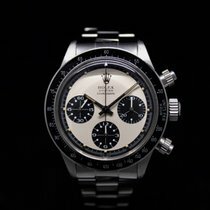 You can purchase a Daytona with a Paul Newman dial for around 247,000 USD. If you can do without the "exotic" dial, you can get a vintage Rolex with reference number 6239 for about 65,600 USD. Aside from the Daytona 6239, Paul Newman also wore a timepiece with reference number 6241. This Rolex Paul Newman Daytona is almost indistinguishable from the 6239 except for its black acrylic bezel . Rolex produced fewer 6241 watches than the 6239. Therefore, the 6241 is much rarer and more expensive. Plan to spend over 272,000 USD for a Daytona 6241 with an exotic dial in very good condition. The manual Valjoux 722 chronograph caliber powers both the 6239 and the 6241. 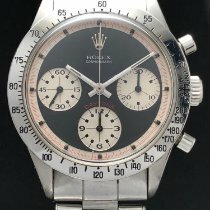 Another Rolex Daytona Paul Newman model has the reference number 6262. This chronograph looks identical to the Daytona 6239, but features a different caliber. Rolex used the Valjoux 727 for the 6262. This movement is an evolution of the Valjoux 722. While the Valjoux 722 ticked at 18,000 alternations per hour (A/h), the Valjoux 727 had a frequency of 21,600 A/h. 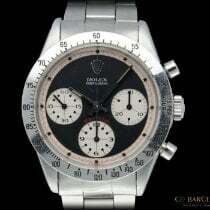 A Paul Newman Rolex with the reference number 6262 goes for around 309,000 USD. The same reference number with a standard dial comes in at about 49,500 USD. This model is extremely rare since it was only in production for one year. This is also true of the Daytona 6264, which is also powered by the Valjoux 727. Unlike the 6262, the 6264 had a black acrylic bezel. Prices for 6264 models vary greatly depending on their condition, but often sit above 371,000 USD. Variants without the coveted Paul Newman dial are much less expensive. Models with reference numbers 6265 and 6263 are also available with the Paul Newman look. However, these models were given a new feature: a somewhat thicker Oyster case and screw-down push-pieces at two and four o'clock. Furthermore, aside from the tricolor dial, there was also a bicolor white and black version – the classic "panda" dial. Either "Rolex Oyster Cosmograph" or "Rolex Cosmograph Oyster" was written beneath the crown at 12 o'clock. The latter inscription is especially rare. Rolex had previously used the inscription "Rolex Cosmograph" on the dials. The 6265 and 6263 are powered by the Valjoux 727 caliber. Rolex outfitted the 6265 with a steel bezel, while the 6263 had a black acrylic bezel. 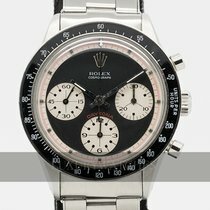 Be sure to set aside around 247,000 USD for a Rolex Paul Newman Daytona with the reference number 6265. A standard 6265 without the special dial is significantly less expensive. These models go for as little as 65,600 USD in very good condition. The 6263 with a panda dial is one of the most highly coveted and expensive versions of the Rolex Daytona Paul Newman. One such model sold for around 1.1 million USD at a Christie's auction in 2013. The standard edition of this Daytona only costs about 75,500 USD. You can recognize a Rolex Paul Newman Daytona by its dial. It's hard to believe, but the dial is the only feature that differentiates a Paul Newman from other Daytona models. The defining feature of a white or black Paul Newman dial is its contrasting subdials at nine, six, and three o'clock, as well as a dial edge that matches the color of the subdials. The indices on the edge of the dial are often red. Connoisseurs call this tricolor design an " exotic dial." The term "panda dial" refers to the bicolor version. Panda dials tend to be white with black subdials. Versions with a black dial and white counters are referred to as a "reverse panda dial." 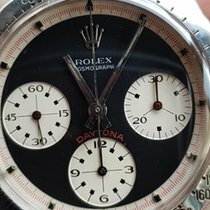 If you examine the subdials on the Rolex Paul Newman Daytona closely, you will find additional differences to standard Rolex chronographs. Paul Newmans have numerals in an Art Deco style and small squares at the end of the indices. The numbers 15, 30, 45, and 60 are visible on the small seconds dial at nine o'clock. Standard Daytona chronographs only feature 20, 40, and 60 on the small seconds subdial. Furthermore, there's a small gap between the outer minute track and the subdials on the Paul Newman. Many also have red indices on the edge of the dial, allowing you to measure times within a fraction of a second. From a technical standpoint, the standard Cosmograph Daytona models from the 1960s and 70s are identical to the Paul Newman Rolex. The only difference is the dial. Since versions with exotic dials had difficultly selling, Rolex ended up producing them in very limited numbers . This is why the Paul Newman Daytona is incredibly rare today, which increases the demand and price. It was most likely Italian watch collectors who catapulted the timepiece to fame. Today, it is one of the most in-demand vintage watches in the world. Paul Newman's own timepiece sold for 17.75 million USD, making it the most expensive watch of all time. Every Rolex Paul Newman Daytona is incredibly rare, regardless of its reference number. You should pay close attention to its original condition when purchasing a Paul Newman Daytona. There are many, many watches with fake Paul Newman dials; replicas are also on the market. You'll often find Daytona models that originally had standard dials which were later replaced with a panda or exotic dial. They may look like a Paul Newman, but looks can be deceiving. Get as much information from the seller as possible and review everything carefully before you make a purchase. Does Rolex still make the Paul Newman Daytona? Rolex is not currently producing any new Paul Newman Daytonas. If you're interested in a current stainless steel model, you should consider the reference number 116500LN. This Cosmograph Daytona is available with a white or black dial. Its bezel is made of black ceramic. This stainless steel watch is so popular that wait times of a few months are to be expected when purchasing one from an offline retailer. If you want it sooner, you can buy it online on Chrono24. New models cost around 20,900 USD. The in-house caliber 4130 powers this chronograph and has a 72-hour power reserve. There are also other companies, such as Project X and Blaken, that offer modified Daytona watches. Since the Paul Newman Rolex is in such high demand, both companies have made limited editions designed after the vintage watch. The watches from Project X cost around 22,300 USD new. Prices for a pre-owned Blaken Daytona start around 23,500 USD, while they cost 34,700 USD new.